Inspired by Monaco's dynamic and emblematic Grand Prix, Lady Victory has been designed to reflect the contemporary face of the Principality. The body of Lady Victory has been formed by a daring use of steel, painstakingly spun from thin wires of the metal. 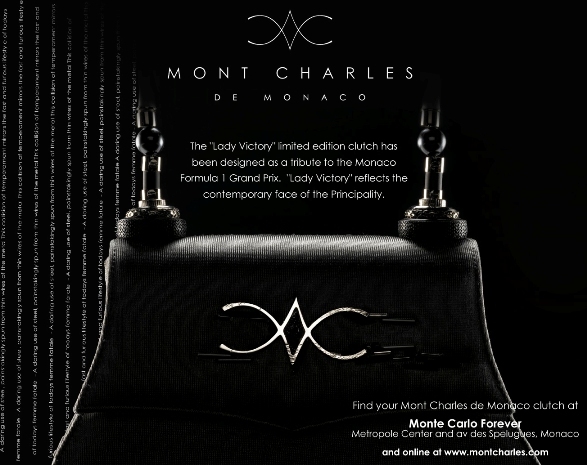 Striking yet seamless, the Mont Charles de Monaco logo is complimented by small crystals which convey the human thrill of speed. Lady Victory s striking handle expresses every facet of Monaco s fervour for the Grand Prix lifestyle. The base of each side has been boldly crafted from tire rubber, each linked by a solitary black pearl, an enduring symbol of Monaco itself. The handle culminates in a flawless fusion of enamel and steel to produce the distinctive red and white pattern of the chicanes of the Grand Prix circuit, as well as the historic colours of Monaco itself. Limited to 20 pieces in 2009, Lady Victory exudes the excitement and irrationality of pure, untamed speed. This collision of temperament mirrors the fast and furious lifestyle of today s ultra glamorous femme fatale.